Since late last year, it's been possible to recycle soft plastics in Auckland. As well as actual plastic bags, you can recycle all sorts of things - small things like muesli bar and sweet wrappers and bulky things like bubble wrap. The recycling is collected at supermarkets*, rather than with the other kerbside recycling, so we needed a separate container to accumulate it in. Initially we used a plastic bag sock, but that wasn't very suitable: small things fell out, and transferring the contents into a plastic bag to put into the recycling container was a pain. I realised I wanted a way to accumulate the recycling in a container that could itself be recycled (to eliminate the double-handling we'd been doing), was quite capacious (to accommodate bulky things like bubble wrap) but that had a firm base and a tight top (so little things didn't fall out). *find your local collection site here - they're in Auckland, the North Shore and Hamilton, with hopes to expand throughout the country over the next few years. Inspired by the rubbish bin we had when I was a child (which held heavy paper bags securely in place by folding the top of the bag under a rigid ring), this is what I came up with. 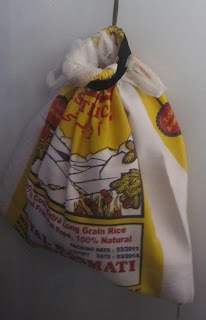 A bag that contained a regular supermarket plastic bag, with the handles of that bag folded over a rigid ring and secured by a loop of elastic. When the bag is full you tie the handles of the supermarket bag together then remove it through a zip at the bottom. removing the internal plastic bag full of recycling. my bag was a similar width to the supermarket bag I wanted it to contain, but taller than needed. 1. Cut the top and bottom off the bag to make a tube as wide and tall as the supermarket bag. 2. Insert a zip across the full length of the bottom of the tube. 3. Fold over the top of the bag to make a narrow tube that will comfortably hold the cable (like the tube you would make to hold elastic). 4. Insert the cable into the tube. 5. Form the cable into a loop that you can comfortably put your hand through, but that isn't much bigger than that. This will form the mouth of the bag: you don't want it too big or it will gape open and things will fall out. When you're comfortable with the size of your loop, cut the cable so that the ends overlap a little and join them with duct tape. 6. Sew the tube shut over the joined-up cable ends. 7. Make a circle of elastic that's tighter than the rigid neck of the bag. This is what will hold your plastic bag in place - if f the elastic isn't fairly tight, the handles will just fall out. I initially made mine too loose and had to shorten it - that's why you can see it's sewn in two places. 8. Sew the elastic onto the bag, a little below the tube with the cable in it. Attach it at both the middle of the front and the middle of the back. If you only attach it at the back, the plastic bag handles won't stay put. I stitched a square at each attachment point to spread the load. As you can see - the elastic needs to be surprisingly tight. 9. Form the tape or cord into a loop and attach at the centre of the back. If you're going to hang your bag off a door-handle, it'll need to be quite long; if you're hanging it off a hook it can be a lot shorter than mine. Here you can see how the elastic was attached by a square of stitching. We've attached ours to a hook on the side of our fridge (using a long loop as I originally intended to hang it from the pantry door handle). It's best to hang it in a low-traffic area. Our pantry door is right next to a door we use all the time, so when we hung the bag there we kept walking into it, causing it to swing around and generally get in the way. Since we've moved it, it's been fine. bag hanging at right-angles to the pantry door after being walked into.